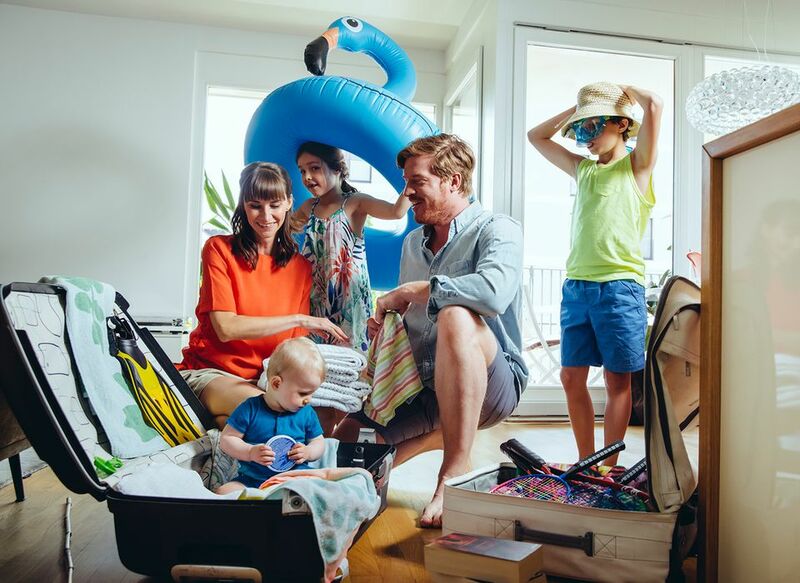 Getting ready for a family trip can feel overwhelming with so many last-minute tasks. We've got you covered with our handy, printable packing lists, travel tips, and travel gear guides—all which will save you time and help keep you organized. Pack activities that will keep everyone from getting bored in the car or on the plane. We have included lots of free games and things to do that you can print out before you leave. Going to the beach is a classic family vacation destination. While it may seem like all you need are some t-shirts, shorts, and a swimsuit, there is much more you need to pack. And, you wouldn't believe the price of something like aloe vera or sunglasses at a beach resort. It's better to buy these things before you leave. This free printable packing list will make sure you have everything you need for your sand-and-surf getaway. Taking a cruise on a ship geared for families can also be an ideal vacation. Read up on your cruise ship's children's programming and itinerary for clues to specific items you might need. Typically, you will pack activewear, smart casual wear, and at least one dressier outfit for each family member. This free printable packing list will make sure you don't forget anything for your adventure at sea. Heading for the slopes in winter is exciting for all ages. Think through how you'll spend time both on and off the mountain, including whether you'll be hanging out in a cozy condo or exploring a chic ski town. This free printable packing list will make sure you have everything you need to keep warm on your family ski vacation. The kids will certainly get excited when they hear that they are going on a Disney cruise. While you can dress casually for this cruise, you may want to pack a few special outfits for dinner in one of the upscale restaurants. Reviewing your itinerary will also help you pack for theme days and parties. This free printable packing list will make sure you're covered for events like pirate night and a whole vacation filled with onboard fun. Some family vacations involve hours of driving or long plane and train rides. To keep the little ones entertained, print out an assortment of travel games. Our games include scavenger hunts, bingo, a license plate game, hangman, word searches, connect the dots, and more. For families heading off on a Disney vacation, get kids excited for the trip with free printable activities to do in the car or on the plane. Our games include Disney-themed word searches, mazes, word scrambles, and more. There are some great things to keep kids entertained on a road trip that doesn't create too much noise, take up too much space, or make a mess. One fun thing to bring is a deck of scavenger hunt cards. The whole family can compete as they all try to spot objects listed on the cards. In addition to cards with objects such as "red car" or "license plate with the letter Z", some special “Hear It”, “Feel It” and “Smell It” cards encourage kids to use all their senses to explore their surroundings. Our toy and game suggestions are sure to keep backseat boredom at bay. The items you decide to pack—or not pack—can make a huge impact on your vacation experience. We've put together a gallery of tried-and-tested products we love for family getaways. Innovations like a compact beach kit, with all the essentials and a grab-and-go booster seat that's 10 times smaller than regular boosters but just as safe, will give you ideas on things to bring. If taking a vacation with a baby or toddler feels overwhelming, it's time to streamline your load with gear that's portable and lightweight. We've put together some essentials. Find out about lightweight strollers and travel beds, an FAA-approved harness for flying, and a light-weight travel high chair. It's not easy to find one perfect bag that can get you through an airport, museum, national park, theme park, and around town—but we've put together a tried and true collection of terrific bags for all kinds of trips. Organization is key to fitting necessities in fanny packs, backpacks, and messenger bags and our selections are known for packing in what you'll need for the day without being bulky. Packing for that much-deserved family vacation is way more fun when you've got the right gear. We can help you find the perfect luggage for all ages. How about a ride-on suitcase for a little one or fun and colorful designs for the older kids? These luggage ideas will bring smiles to your kids' faces as they pack for a trip or vacation. When you pack for a trip with children, there will be a lot to think about. It's important to think through what to pack in your checked luggage and what you'll want to keep with you on the plane. We provide a list of must-have items for your carry-on bags so you have those children's necessities with you on the plane. Most important are documents and medications but children like the familiar tech game or teddy bear when they are flying, too. It's such a bummer to arrive at your destination, open your suitcase, and find that your carefully packed clothing has been reduced to a rumpled mess. These easy-to-follow packing tips will keep your whole family looking crisp and wrinkle-free. There are ways to roll, fold and contain clothing that will keep them neat and wrinkle-free. And, for the little ones, packing outfits in zip-top bags can be a great idea. Finally, pack essential tools that will help you stay on track during your trip. We've selected the best travel apps to download before you go. They'll help you create your itinerary, find interesting places to visit, navigate the airport, and much more. If you're going out of the country a language translation app and currency converter app may be lifesavers. And sometimes the most innovative and necessary app you download will be something like the "Sit or Squat" app that tells you where to find public toilets and even rates them.